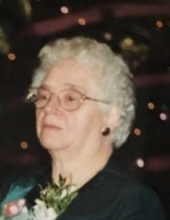 St Albans - Theresa S Towle, age 91, passed away peacefully on Wednesday December 5, 2018, at the Holiday House in St Albans. She was born October 12, 1927, in Fairfield, VT to Ferdinand and Mary Louise (Larose) Smith. Theresa was an avid Bowler, bingo player and loved to play cards with family and friends. She worked for many years as a cook at a local restaurant and the St Mary's convent and rectory. Her survivors include her husband Sonny of 68 years; her children, Robert Towle of St Albans, Jane Towle and Jean Schafer of Vienna VA, Betty and Scott Popple of St Albans and their children Serge (Jason), & Samantha and Laura and Donald Gilbert of Swanton and their children Nicholas (Karissa) Bouchard, Makayla and Kyle Gilbert. She is also survived by her sisters, Simone Frechette, Annette Montagne, Maria and Donald Ploof, sisters-in-law, Kathy and Shirley Smith, Linda and Merle Van Gieson, brother- in-law, Carmen Mayhew and many nieces, nephews and cousins. In addition to her parents, she was predeceased by her brothers, Raymond, Gerard, Armand and Lawrence Smith, sisters, Jane Mayhew, Rose West, Sister Cecile Smith, brothers-in-law, Lynwood West, Frank Montagne, Rowland Towle, Luscious Wright, Johnny Bergeron and George Lafountain, sisters-in-law, Janice Lafountain, Myrtle Bergeron, Leona Towle, Clara Demers and son-in-law, Laurent Bouchard. Relatives and friends are invited to attend calling hours on Sunday, December 9, 2018, from 4:00 - 7:00 PM at the Heald Funeral Home, 87 South Main Street, St Albans. A Mass of Christian Burial will be celebrated on Monday, December 10, 2018, at 11:00 AM at St. Mary's Catholic Church, 45 Fairfield Street, St Albans, with the Reverend Maurice J. Roy as celebrant. A reception will follow at St Mary's Parish Center. To send Theresa’s family a message of condolence or share a memory, kindly go to her on-line guest book at www.healdfuneralhome.com. To plant a tree in memory of Theresa S. Towle, please visit our Tribute Store. "Email Address" would like to share the life celebration of Theresa S. Towle. Click on the "link" to go to share a favorite memory or leave a condolence message for the family.